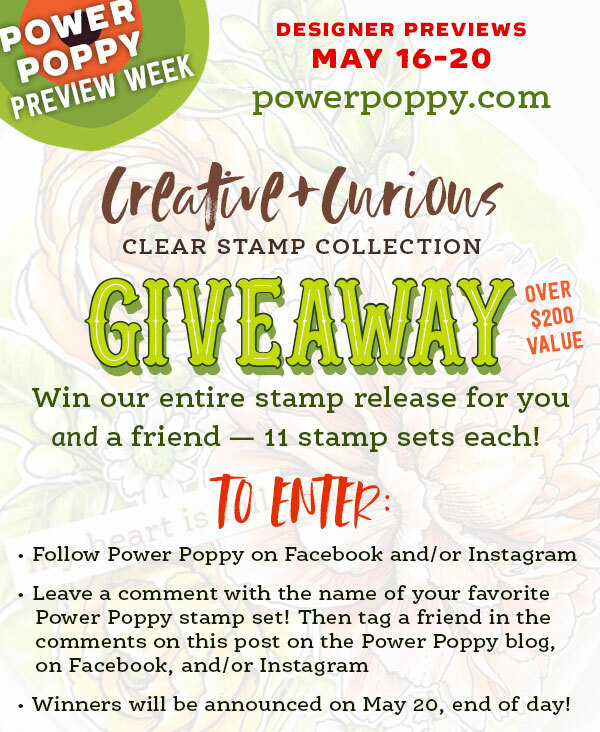 Welcome to day four of our Power Poppy Preview Week and the Creative & Curious Collection! Today there are three sets being previewed, and I’ll show you two of them. 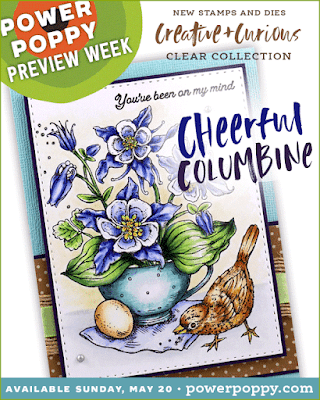 Let’s kick it all off with Cheerful Columbine. 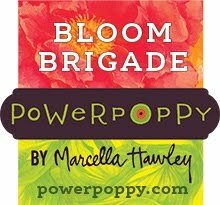 Marcy has this way of putting sweet things into other sweet things and coming out with an arrangement that’s both unique and beautiful. 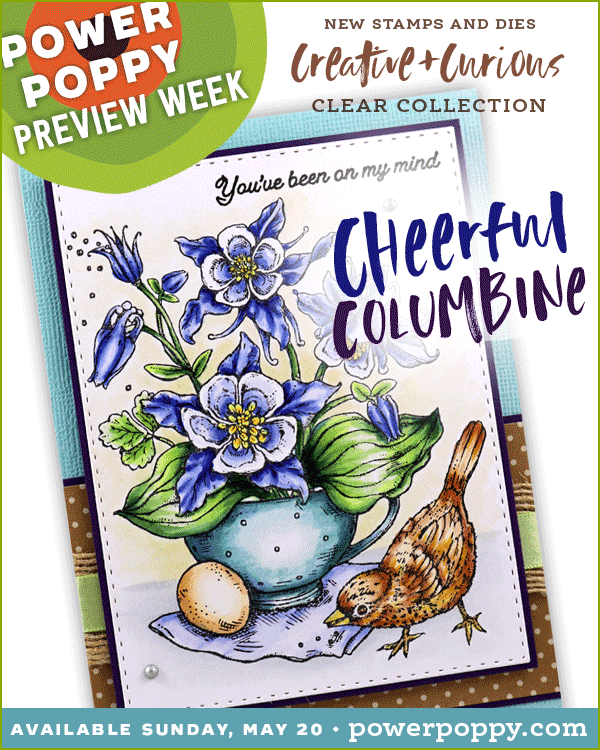 This set makes a teacup into a planter of columbine and hosta, adds in a sweet bird, egg and scrap of cloth and makes it into a masterpiece! Since this little bird was drawn to be a baby robin, I used that colour palette through my design and coloured up those gorgeous columbine flowers in a soft red, adding an earthy cup with red polka-dots and then that robin’s egg blue in the egg, echoed in the blue-green of the hosta leaves. My photograph didn’t capture the whole sentiment but it reads “You’ve been on my mind”. Isn’t that bird amazing? I’ll love how Marcy illustrates birds! And now I’ll show you a set that will make you SO happy if you’re a polymer stamp fan! 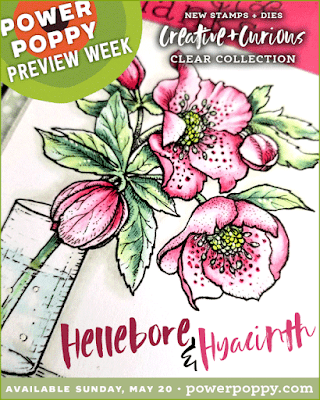 One of my all time favourite images of Marcy’s is the hellebore in a glass. There’s just something about the abundant blooms heavily tipping over in the arrangement that speaks to me, so I’m crazy happy to have this image, and the beautiful forced hyacinth in glass together. Marcy made them nice and large so they are really great to colour up! Here is Hellebore & Hyacinth. 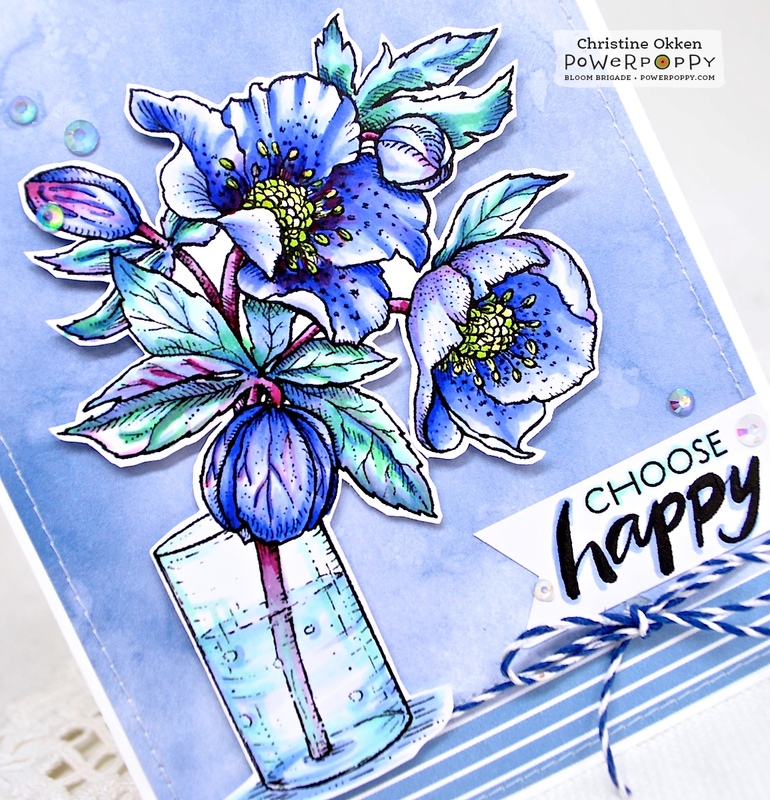 I call this one a “moody hellebore” (which is a bit funny when you look at the sentiment!). 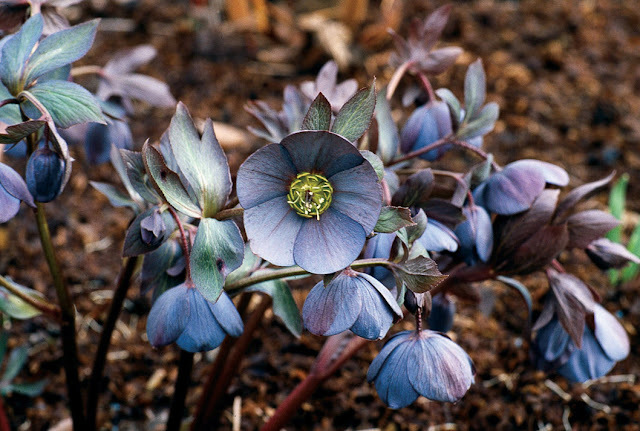 The tones hellebores can come in are so lovely. A lot of new hybrids mix some unusual colours together. I found a gorgeous hybrid that mixes a deep grey/purple/blue with burgundy and pink, so I wanted to recreate that in my colouring. The paper is from MFT and really captures that monochromatic moody blue I was going for. I kept the design really clean and simple, adding only sewing, some baker’s twine and some faceted gems that reflect some of the colouring on the petals. Don’t forget about the amazing Creative and Curious Giveaway - you can enter on the Power Poppy Blog, Facebook or Instagram! Both are simply beautiful Christine. The strips on the blanket are super sweet idea and your hints of purple in the on the second are wonderful. Simply beautiful sneaks girlie! 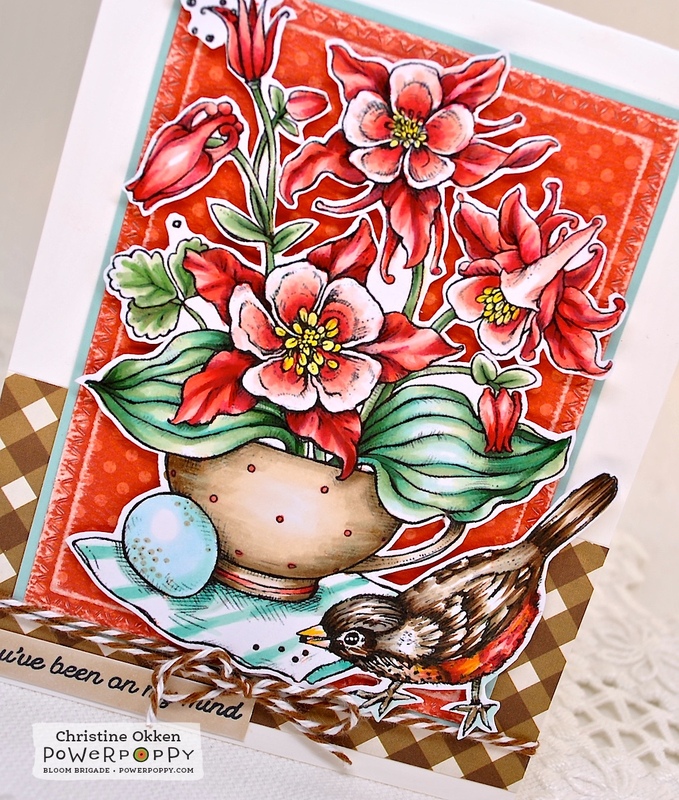 Knockout colors on both, Christine! So beautiful with the images cut out for extra impact. Love these! Gorgeous cards! Your first card is so vibrant and bright but the second one is just as amazing with the more muted color palette. Lovely job showcasing these new sets! LOVE the first card, and the colors are just perfect! Also LOVE the second card, and the blue monochrome look is the perfect touch. Wow these are so stunning!! Especially the first, I just love the colors! Tall about a Rockin' Robin!! Yowza! And I've never seen hellebores with such vivid colors! Cool!! 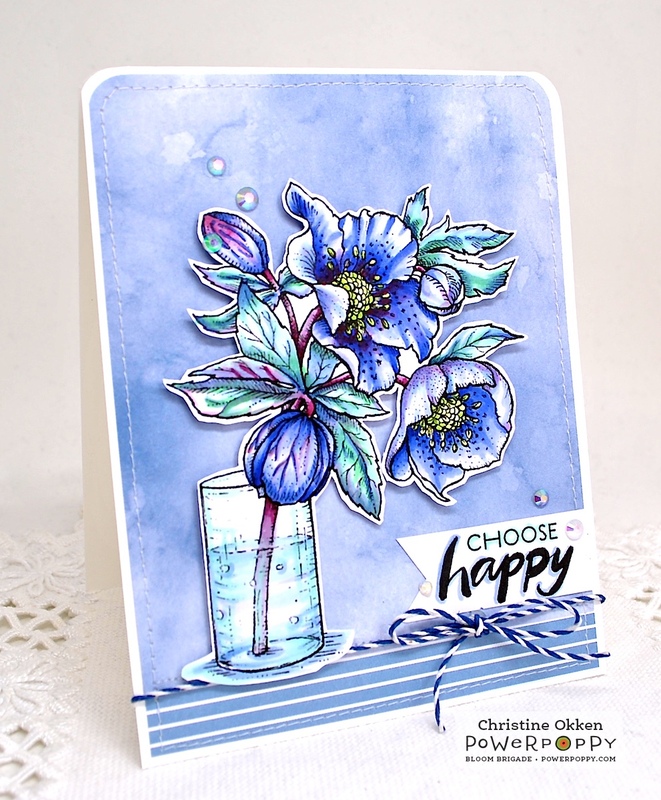 Wow... the columbine si so pretty! Jaw droppingly gorgeous Christine! 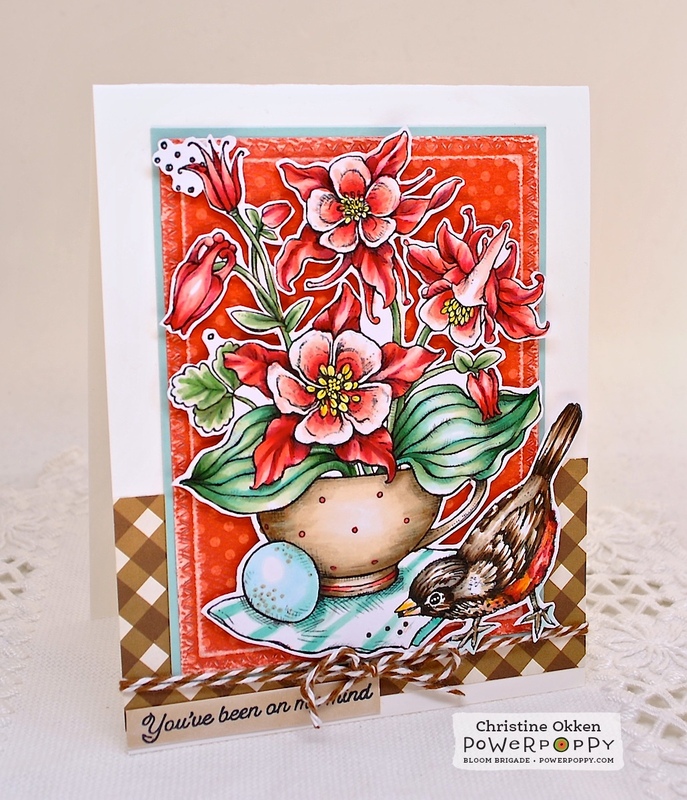 Love the red on red with that sweet Robin! Gorgeous blue tones on the blooms for the 2nd one. Stunning friend!